Each stage of the season has different and unique challenges. Bird of prey activity has skyrocketed in the past couple of weeks. A juvenile Peregrine Falcon has frequented the colony practically every day for the past week and sometimes comes in 2 or 3 times a day. Luckily, the juvenile Peregrine is still learning it's trade and hasn't managed to pick any off any just yet. However, an adult Peregrine took out an adult Little Tern over the colony on the 7th of July. There is nothing we can do to prevent a hit and run predator like a Peregrine Falcon attacking the colony. It is the fastest bird in the world after all! Fortunately they do not tend to take many birds. Peregrine Falcons employ an almost cheetah like strategy where they use an incredible burst of speed to attack the colony and single off an individual bird. Little Terns are also master aviators and are usually capable of avoiding such attacks. Kestrels, on the other hand, will come to the colony and hover looking for the chicks. This gives us time to chase them off using state of the art anti-Kestrel technology (see below pic). If you ever see a warden running down the beach banging a frying pan and a saucepan together do not worry we haven't gone crazy (although that should not be ruled out!) we are just trying to scare off the Kestrel. Luckily we have only had to do that once this year. The Kestrels have not yet copped that there are chicks on the beach and hopefully it will stay that way. We have had occasional glimpses of Sparrowhawk (which took an adult Little Tern last year) and Long-eared Owl but they have not yet posed any threat. We have spotted a Fox on the beach on 2 occasions well north of the colony, snooping around, but it hasn't taken any notice of the terns. So, all in all, everything is going according to plan. 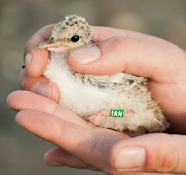 If the wee chicks can get through the next 3 or 4 weeks unharmed they will begin their journey back to Africa. We will be here, doing our best, to make sure that they get that far. 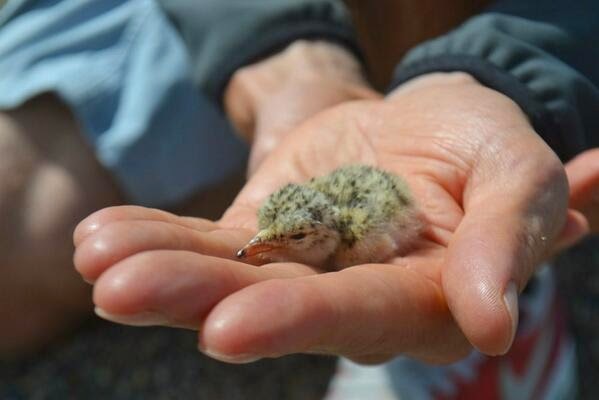 Next week's blog preview: Kilcoole and Baltray Little Tern colour ringing scheme and celebrity volunteers. 200 chicks, colour ringing and Moths!